ANNAPOLIS, Md.—On the first hot spring weekend this year, 4,000 people in suits and sundresses watched the croquet teams of St. John’s College and the Naval Academy duel for the "Annapolis Cup" in what is, without a doubt, the greatest collegiate rivalry in the American history of English lawn sports. 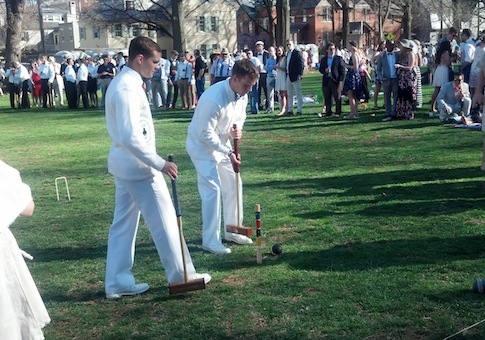 The 32nd annual croquet match between the St. John’s Johnnies and the Navy Midshipmen is several things rolled into one: an unparalleled college sports rivalry, a lavish outdoor party, and the kickoff of the spring social season in well-heeled Annapolis. 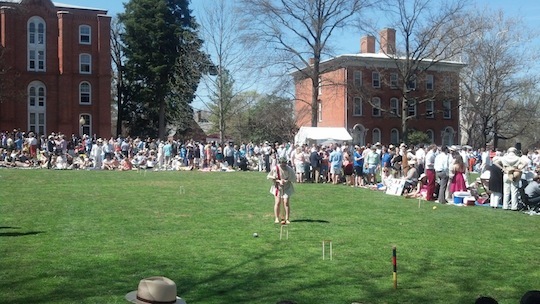 At least three attendees informed me the games played on the quad of St. John’s are "the most well-attended croquet match in the world," which seems likely enough to take on faith. Part of the appeal is the novelty of an obscure sport played between two polar opposites. St. John’s is a Great Books college. Only a few blocks away is the Naval Academy with all its spit-shine polish and rigor. But the Naval Academy is the historic underdog. Over the 32 years, Navy has been comically outmatched by St. John’s, with an overall record of seven wins to 25 losses. Over the years, the match has also turned into Gatsby-esque gala. 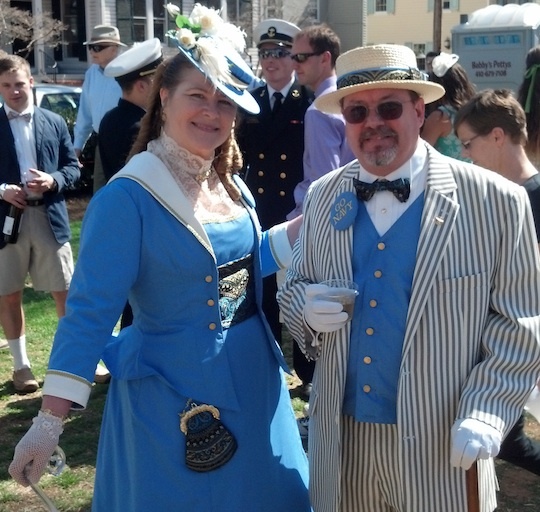 The crowd this year was a vast sea of seersucker, madras, sunhats, boat shoes, Bermuda shorts, bowties, suspenders and cigars, parasols and top hats—any and every signifier of American gentility, from Southern aristocrat to New England WASP to Victorian fop. The younger spectators were slugging white wine and champagne from the bottle. In addition to the finery, many attendees wore orange "BEAT NAVY" buttons. It’s like a tony, Tidewater version of the Iron Bowl. "I love drinking in public outside and wearing fratty outfits," a tipsy South Carolina undergrad told me, gesturing to her houndstooth dress. "My sister is in the Naval Academy, so I’m rooting for them, but don’t tell." The Naval Academy’s Trident Brass Band played standards, such as "Blue Bossa" and "Embraceable You" while couples twirled in front of one of St. John’s old brick halls. Scattered among the crowd were pockets of Midshipmen in their service dress blue uniforms. The commandant of the Naval Academy, Capt. Bill Byrne, was also weaving through the crowd. Lanky and easy to spot by the stripes on his sleeve, he never made it more than 10 steps without being stopped for a handshake or a picture with a group of co-eds hoisting bottles. "This is huge," Byrne said of the annual match. "We’re all about tradition in the Navy. It’s also a chance for us to let our hair down a bit, although, you know, we don’t really have hair to let down." Over by the Johnnies’ tent headquarters, I talked to Jack Whitman, a junior playing on this year’s team. How did they prepare for the game, I asked. "Y’know, we drink some, we play some," Whitman said. "It’s a relaxing environment." He said the Johnnies practice twice a week. Whitman advised me to stroll among the tents to the side of the playing fields and snag food from the ongoing parties. "It’s like a tailgate, but with Whole Foods," he said. "And make sure you drink. Drinking is important." Ambrose Donnelly, the Johnnies’ food and drink man, said his team’s bookish background gave them an edge. Freshmen at St. John’s learn geometry by reading the ancient Greek masters. "Euclid is pretty deece," Donnelly said, "but Archimedes, geez, that guy assumes his readers are geniuses." Every year, the Johnnies dress up in different costumes as a dig at the straight-laced Navy team. This year, they wore togas and played barefoot. Last year, the team decided on a Where’s Waldo theme. The costumes are top-secret and not revealed until the day of the game. The Midshipmen always wear white slacks, shoes, and sweaters with the Naval Academy "N" stitched to them. On the other side of the sweaters is a patch for the 28th Company and its motto: "We’re not here for a long time—We’re here for a good time." Over in the Naval Academy tent, sophomore team member Mario Kohn told me the Midshipmen had been practicing every day for the past three months. 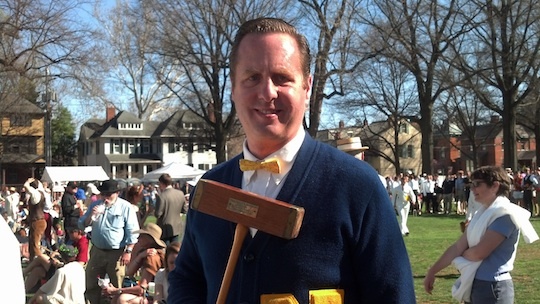 The Navy croquet team has always been from the 28th Company. However, Kohn said that last year, after a seven-year string of losses, the commandant threatened to open the team up to other companies if the 28th didn’t get a win. The 28th avoided that dishonor, handily beating the Johnnies 4-1 in a best-of-five. The coveted Annapolis Cup trophy sat in the Navy tent this year, instead of the Irish pub where it had been kept for years. Other Midshipmen stood by the side of the field in their fancy white dinner dress jackets and acted as caddies, handing mallets to the players. Across the field, the Johnnies’ caddies, wearing baggy overalls, brought the players drinks and cigarettes in addition to mallets. How did such an elaborate and bizarre tradition begin? I heard no less than three origin stories concerning the annual match. The first goes like this: The commandant of the Naval Academy was talking to a St. John’s freshman one day and proposed there was no activity in the wide pantheon of sport at which St. John’s could best his Midshipmen. "What about croquet?" the freshman asked. In the second, highly dubious version, a Midshipman or a Johnnie—this detail varies—was killed in a bar fight, and St. John’s sponsored the match to improve relations. Shaun Callahan (Naval Academy Class of ’85) told me the third story. Callahan was following the game from the sideline Saturday and discussing arcane croquet strategy with other spectators. According to Callahan, a reporter at the St. John’s student newspaper was assigned to cover the school’s croquet team, only to discover there wasn’t much of a team to cover. It was mostly a ruse for players to buy beer with the $50 stipend that St. John’s gave its club sports teams. So the reporter, in a fine example of intrepid journalism, created a story by sending a letter to the Naval Academy commandant, proposing a match between the two croquet teams as a sort of "Athens vs. Sparta" contest. The commandant declined, but rumor of the letter spread through the academy until it reached Callahan and the boys at the 28th Company, who took up the challenge. Whatever the case, the Mids and the Johnnies met on the croquet pitch for the first time in ’83. Callahan had grabbed some old croquet gear from his grandpa’s garage. None of them had ever played before, but they were Navy after all, and how good could the hippies at St. John’s be? Around 200 people attended that first match, Callahan said. "That year everyone, St. John’s went way over the top," he said. "They were out there unicycling and stuff, trying to be as freaky and nonconformist as possible." The Mids got stomped 3-0 in the inaugural match. The next year, they narrowly lost. Finally, Callahan and his team prevailed in 1985. Standing on the sideline, Callahan leaned on the same mallet he used to win the ’85 match—now adorned with a small metal plaque to commemorate the event—and talked about the tradition with the misty pride peculiar to college sports. "This has gone from a beer-drinking club to both teams being invited to nationals every year," he said. This year, the competition was fierce. The first three games dragged on through the afternoon, entangled in deep positional battles and arcane rules beyond the ken of most spectators. Around 4 p.m., the emcee came over the P.A. : "This is just a friendly reminder that the alcohol will stop flowing in 30 minutes. Also, as of 10-minutes ago, the score was a thrilling 0-0. Beat Navy." Three-and-half hours after one game began, Johnnies player Samuel Collins knocked a croquet ball against the wooden peg at one end of the field, sending the spectators who understood the rules of the game into pandemonium. A teammate leaped into his arms. The Johnnies had won a hard-fought comeback, but the Mids took the other two, sending Navy ahead 2-1. The final two games stretched until 8 p.m., and the last was decided by a sudden death round after the sun went down. Navy took both to win the match 4-1—its only consecutive victory in more than 30 years. And that day was the most excited anyone has ever been about croquet.